Holy Week services are planned at many area churches; other upcoming events include a country breakfast, a Nelson's chicken fundraiser and a concert. Upcoming events include several meals, some Lenten events and fun Easter activities, and a men's breakfast. Several concerts, an Easter egg hunt and a men's breakfast are among upcoming events. The Rev. Ryan Fischer has accepted the call to be the new rector at St. Anne’s Episcopal Church in Warsaw. Upcoming events include a free pancake breakfast, a swiss steak supper and Lenten services. WINONA LAKE – Grace College is welcoming several speakers to campus, including Dr. Freddy Cardoza, Lonnie Anderson and Ray Chang. Upcoming events include free community meals, a concert and a rummage/bake sale. 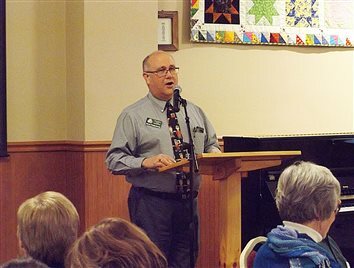 Modernizing facilities, growing the number of campers and more fully using facilities year-round are all part of the “Planting The Future” capital campaign launched by the administration and the Camp Mack board at the annual dinner Friday night. Upcoming events include a gospel concert and several meal fundraisers. NAPPANEE – Grace Point Preschool is having open house/registration from 4 to 6 p.m. March 12 at Grace Point Church. 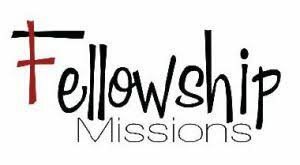 While there was an uptick in the number of people seeking help at Fellowship Missions, 1520 Winona Ave., Warsaw, during the extreme cold in the last week of January, a spokesperson said the homeless shelter has been operating at or near capacity all winter long. Revival meetings and whole hog sausage sales continue, and a baked steak dinner is Friday. Upcoming events include a baked steak dinner, revival meetings, a whole hog sausage sale and a FASCAR rally for kids. A soup cook-off, some concerts, a valentine dinner/dance and a visit from an African bishop are among upcoming activities. Upcoming events include a couple of free community meals and some breakfast fundraisers. New Hope is having a breakfast fundraiser, and Beaver Dam UMC announces service times. Beaver Dam United Methodist Church, Akron, will have combined worship services on Sunday. Beaver Dam United Methodist Church, Akron, will have combined services in a Christmas Sunday/Fourth Sunday of Advent worship service this weekend. Several candlelight services are planned on Christmas Eve. Joe Wilkey, founder of locally based World Compassion Network, was awarded an honorary Doctor of Ministry degree from Agape International University in Phnom Penh, Cambodia. Upcoming events include some concerts, a community meal and holiday services. Several concerts and a message on God's life-changing love are planned. Several concerts are planned in upcoming weeks. Upcoming events include a concert, a service of lessons and carols, and hanging of the greens. Stephen “Steve” Gerber is the new pastor of Palestine Bible Church. A southern gospel concert, an acoustic jam and Thanksgiving services are among upcoming events. Upcoming events include two gospel sings, a baked steak dinner and a service honoring veterans. Marc Goodwin will be installed as the new lead pastor of Christ’s Covenant Church on Sunday. A turkey shoot, an auction, a holiday bazaar and several meals are coming up. Trunk-n-treat, a block party, some concerts, several food fundraisers and a study on the book of Revelation are among upcoming events. Upcoming events include a Trunk or Treat, a concert with multiple Christian artists, revival meetings and the sale of St. Anne's cheeseballs. For those of us who attend a church, we sometimes take the pastor for granted. Upcoming events include several concerts, a community meal and a chili cook-off. NEW PARIS — World Missionary Press Inc. will have an open house in celebration of 57 years of producing New Testaments, Scripture booklets and other religious materials. A classic car cruise-in is part of the Fall Park and Play event Oct. 12 at Leesburg Grace Church. Community members will cast their votes for best in show, with a cash prize of $100 going to the top vote getter. Upcoming events include a men's breakfast, a ham and beans supper, and a Holy spirit service. Upcoming events include Blessings of the Pets services, a community prophecy conference, concerts and a food drive. A homecoming celebration, tour of the campus and an ice cream social are part of the Sept. 30 event. Upcoming events include several concerts, an all-you-can-eat country breakfast and other food fundraisers, and revival meetings. A free community meal, some garage/yard sales and deadline to sign up for the Answers in Genesis conference are among this week's items. 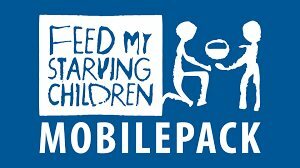 The Feed My Starving Children Warsaw MobilePack recognized Zimmer Biomet and SYM Financial for their contributions to the Warsaw MobilePack. Upcoming events include a free community movie and some meal fundraisers. ATWOOD — New Beginnings Church in Atwood will begin its fall Overcomers Outreach at 6:30 p.m. Wednesday. Upcoming events include a community hog roast, a beef and noodles dinner, and some bluegrass and southern gospel concerts. Warsaw Wesleyan Church has adopted a new name for itself — Pathway Church. Upcoming events include a church supper and auction, an all-you-can-eat pasta bar, a lakeside concert, and the monthly meeting of Men Following Christ. Upcoming events include some concerts, a revival/homecoming and an ice cream social. Planning is underway for the 2018 Angel Share program. Angel Share, hosted by Warsaw Church of God, allows children ages 3 to 17 to select a Christmas gift for a parent, grandparent, teacher or other adult in their lives for $5 per gift. Children also make a Christmas card for their gift recipients. A lakeside service, revival meetings and a gospel sing are planned this weekend. Walnut Creek Church invites children to discover the "God of Wonders" at VBS beginning Monday. Upcoming events include two all-you-can-eat breakfasts, the monthly Men Following Christ meeting and a lakeside service. Upcoming events include some concerts, a car cruise-in and dine, and a service to benefit the Atwood community. Adults can join in the fun at some upcoming VBS programs. Upcoming events include lakeside services with concerts and a special meeting with an evangelist. NORTH MANCHESTER — Victory Christian Fellowship will have a new Healing School session, “Jesus the Healer,” beginning Wednesday. A gospel concert, a church's annual garage sale and an all-you-can-eat country breakfast are among upcoming events. Leesburg UMC and Community Bible Church are planning programs in July. A person may be down but they are never out of God’s grace and mercy. Themes of upcoming Bible schools include "Rolling River Rampage," "Shipwrecked; Rescued By Jesus" and "TimeLab." Upcoming events include a visit from the Machine Gun Preacher and the monthly meeting of Men Following Christ. Some concerts, a tenderloin supper fundraiser and two free meals are among upcoming events. Two VBS's are planned next week. The Rescue performing at a lakeside service, and a men's breakfast is Saturday. VBS offers Bible lessons, food, crafts, music and games. Lakeside services have begun at some area churches; a freedom video series begins Wednesday. My life changed on April 29, 1975. I was a senior in high school at Marshalltown, Iowa, and we anxiously listened to the news coming from Vietnam. "Rolling River Rampage" and "Super Heroes" are upcoming themes. Upcoming events include food fundraisers, a rummage sale and boat-in worship services. Registrations are being accepted for the Sixth Brethren World Assembly, planned Aug. 9-12 in Winona Lake. Upcoming events include revival meetings, a rummage sale, several food fundraisers and a summer program for kids in area parks. Upcoming events include several food fundraisers, a free community meal and a Saturday night sing. News spread around Warsaw in April 1999 that the Ku Klux Klan was going to have a rally at the Kosciusko County Courthouse on Saturday, May 8. A few leaders gathered to discuss how the city should respond. The Salvation Army Women’s Auxiliary began 50 years ago. Fish fries and a haystack dinner are among upcoming events. I always thought that “Good Friday” was an interesting concept. How could anything be good about a day over 2,000 years ago when an innocent man was crucified on a cross? On Friday, First Christian Church, with support from the Kosciusko Community YMCA, played host to Warsaw’s first annual Night to Shine event, sponsored by the Tim Tebow Foundation. 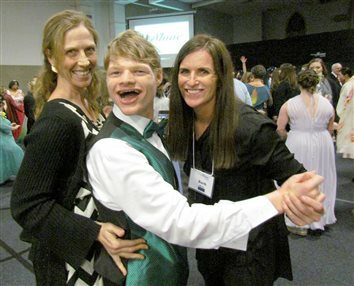 Night to Shine is a prom night experience, centered on God’s love, for people with special needs, ages 14 and older, according to a provided news release. This worldwide movement took place at over 550 churches around the world.